Gram Castle belonged to the king in the 13th century. Commander Hans Schack took over the estate in 1664, and it belonged to his descendants, counts Schack and Brockenhuus-Schack, until 2007. The manor house has three two-storey wings. The east wing is from the early 16th century. The south wing was commissioned by Commander Hans Schack in about 1670, whereas Countess Anna Sophie Schack had the west wing built in 1751-52. The baroque garden was created for the second Countess Schack in about 1700, but needed partial replanting after the hurricane in 1999. It is open to the public. And public events are also held at the castle. The war against the Swedes in 1657-60 was a disaster for Denmark - especially the northern part of South Jutland. Thousands of people starved to death, were wiped out by disease or fled in terror from the marauding enemy troops. 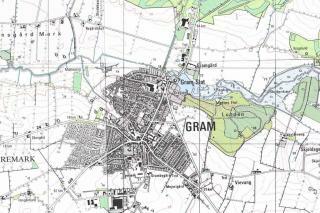 The war left Gram with only seven of its 70 farms and houses still inhabited and the lord of the manor went bankrupt. One of the few people to benefit from the war bought it: Hans Schack. He career spanned various armies and by 1658 he was Danish commander-in-chief. He was promised a high salary and a share of the booty. Hans Schack was soon a rich man. Luckily enough, as he spent a small fortune on buying the abandoned estate and restoring it to its former glory.